Nathan Womack is a serious bike rider, serious enough that he wanted to ride at a training pace on rides with his girlfriend. The trouble was that his preferred pace for training for triathalons was about 20 mph, and his girlfriend’s pace is more like 15 mph. 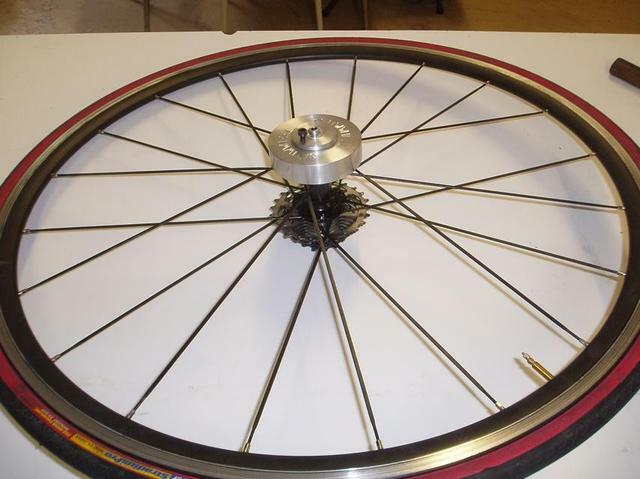 He had the bright idea of making a wheel that would give him some resistance in his rides, so that his speed would equal his girlfriends speed, yet give him the training he wanted. 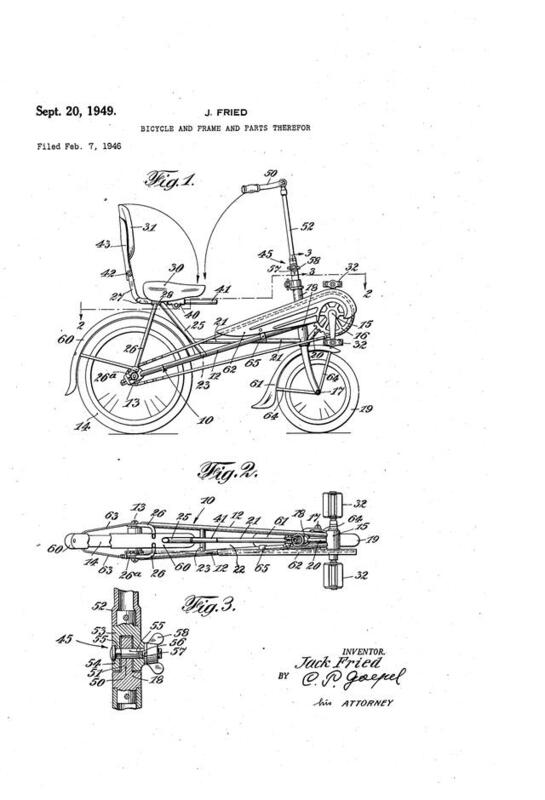 Additionally, Nathan looks to have a children's model out (for children under 5) that will go on a small bike with training wheels to help "slow" the child down as they learn to ride a bike. This will help in coordination as well as be an incredible safety device (as the children will not be able to get going so fast they get out of control). Recently my 15 year old daughter has "adopted" my wife's nice road bike, and has been doing some great rides around town on it. 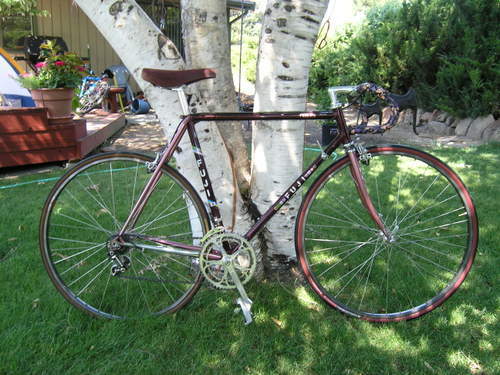 So I thought I'd look for another road bike of about the same size to have a road bike available for both of the ladies in my life. I thought I'd go check out a thrift store bike yard, because my partner Steve found a great mountain bike out there. I went to the bike enclosure of the thrift store, and ran into Steve and his wife Jody, who were scouting for a kids bike. We prowled around together looking for gems, and seeing mostly junk. Now if I could upgrade the shifters to indexed shifters, maybe older Shimano 105 derailleurs and down tube levers, my wife would like it a bit better. Anyone have advice about such an upgrade? 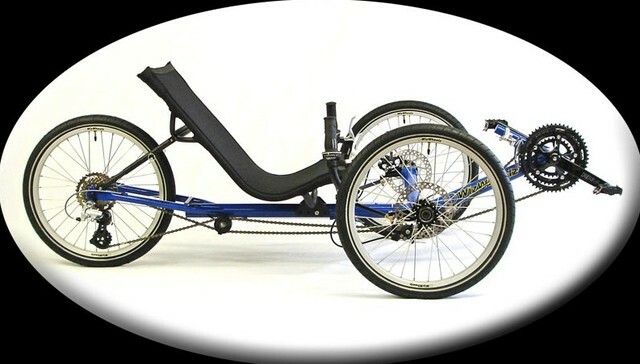 The style of recumbent tricycles with two wheels in the front and one in the rear is called a tadpole recumbent, because like a tadpole, the big end is at the front. 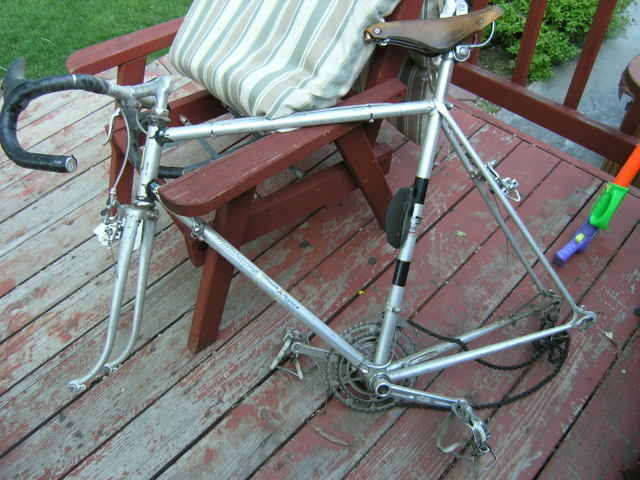 Here is a very low slung tadpole configured recumbent, patented in 1975, and it has the rear wheel as the drive wheel, with the chain passing alongside the seat. 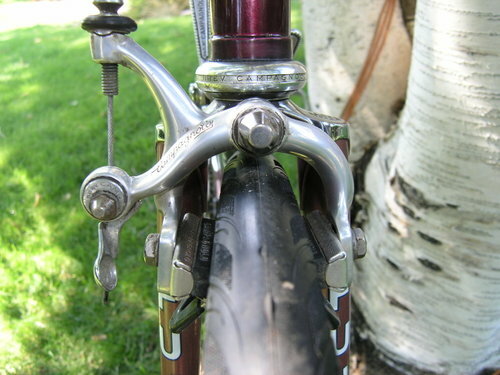 The two front wheels are the steering wheels, and steering is by an underseat control. 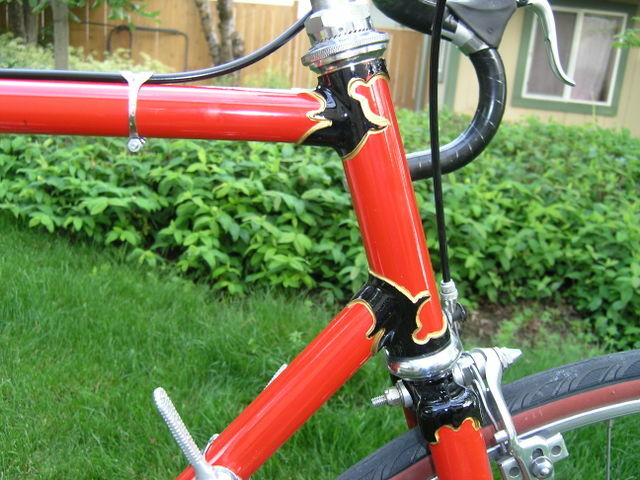 In this style of bike, the rider is way more comfortable, with no leaning forward, no saddle soreness, and no weight on his wrists. The wind resistance is also quite a bit less, which is why recumbents are typically faster than upright two wheelers on flat terrain, even though they are heavier. A really cool tadpole trike is the TerraTrike, and they have all kinds of information on their site at WizWheelz. 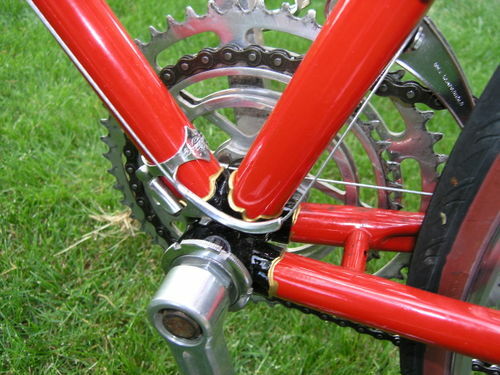 A TerraTrike is shown below the 1975 tadpole. Here is an early (1949) recumbent bike which is similar to many recumbents seen on the road today. 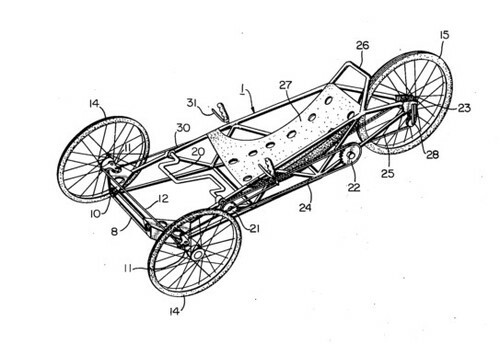 An even earlier recumbent was by Jarvis, and the recumbent that set world speed records was by Charles Mochet. 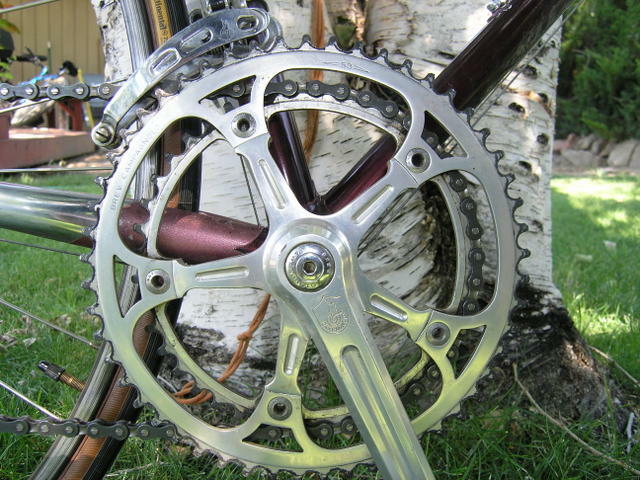 Other bikes in the Bicycle Technology Category. 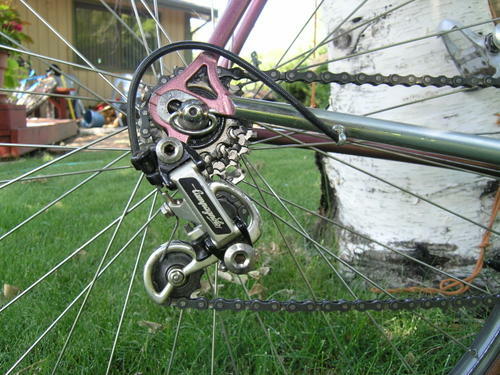 Here is a nice design for a two wheeled tandem bike, with each rider's seat being directly above a wheel. This is from 1891. 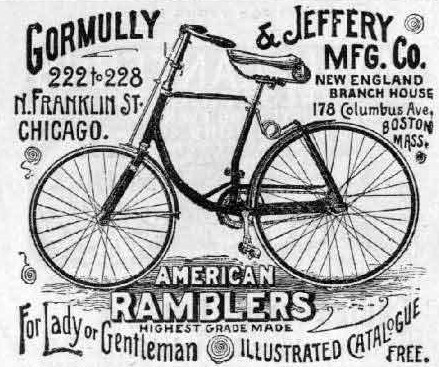 The Gormully and Jeffery bicycles included a model called the Rambler. In 1900 Jeffery and Gormully sold their interest in their bicycle company and bought a factory in Kenosha Wisconsin, and began making automobiles. They kept the mark Rambler, and their cars were called Ramblers. This is Jeffery's first automobile. 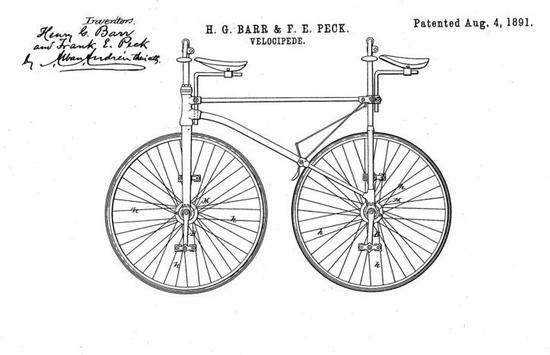 Some of his early designs had a front mounted engine, and a steering wheel, but his first production models conservatively followed the Duryea pattern, and had a tiller and a rear engine. 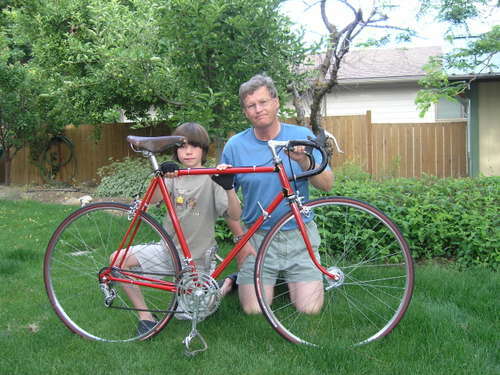 At the age of 14 Andrew Riker built an electric motor in his parent's basement in New York City. Riker later built the first electric vehicle in the United States, in the form of a battery powered tricycle. It was called the Riker Electric. 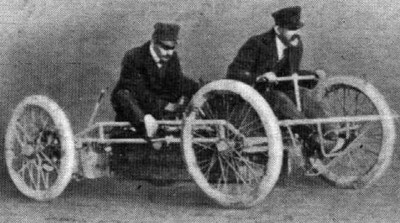 A Riker electric tricycle beat a gasoline automobile built by Duryea in a race in 1896. the Riker electric was built until 1900, when Riker switched to building gasoline powered automobiles. 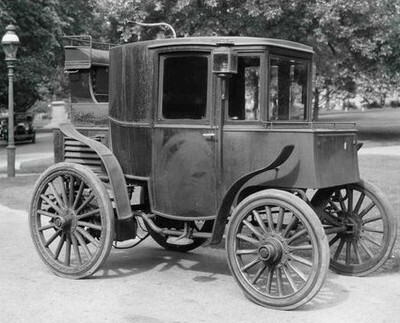 Riker made electric trucks, and built a two person racer which set the world land speed record in 1901 at 57.1 mph. One of his vehicles set a speed record that endured for 10 years. 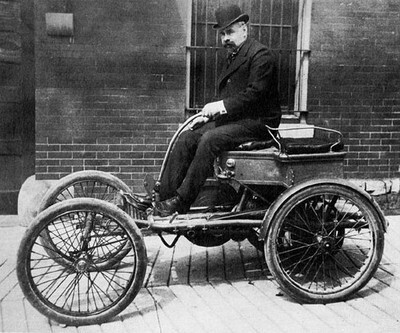 Riker was hired by the Locomobile company to design a gasoline powered car for them, and switched his interest to gasoline engine automobiles. Some people really hate having to put away their motorcycle for the winter, when the backcountry is covered in snow and the old two wheeler just can't travel over snow. Tim Jordan of Donnelly, Idaho had the same urge. 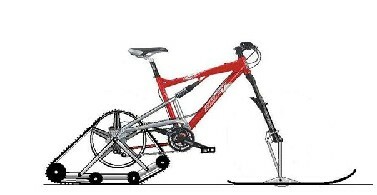 Except he thought it would be nice to modify his two wheelers so that they could operate in snow. First he modified a bicycle. A prototype of the bicycle version is below. Then he built a kit for converting a motorcycle to snow use. 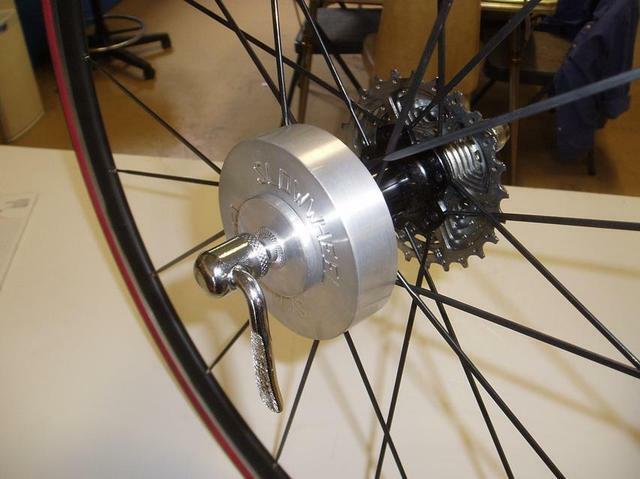 He now makes kits for converting a motorcycle to snow use, which can be seen at his site, Snoxcycle.com. 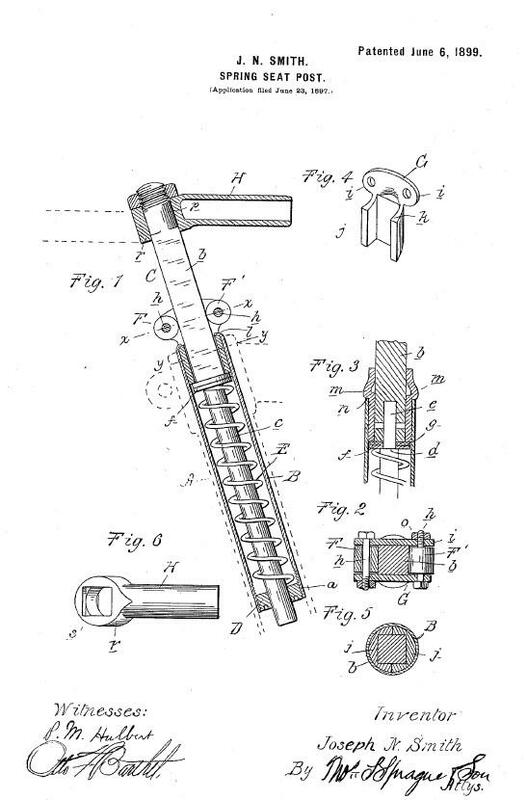 Of course, he's patent pending on the kit, and it has some special features that are improvements over other such conversions.